Submit an entry or check out your favorites in the gallery using the menu links above! 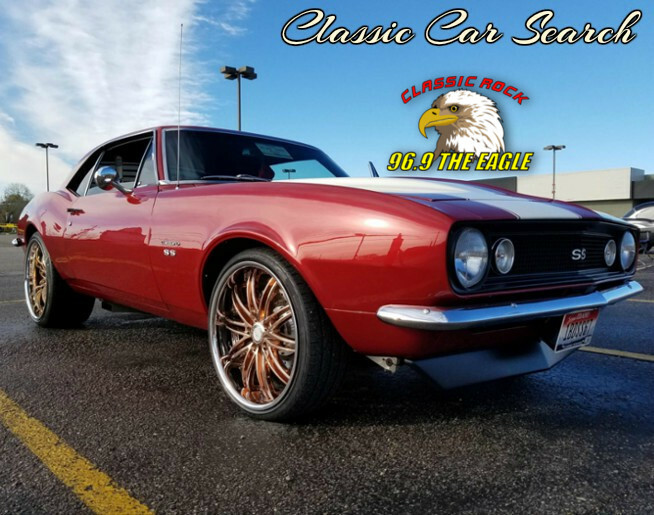 Upload a picture of your car plus your contact information for a chance to have your car featured in the 2019 Eagle Rock Girls Calendar. The Eagle Rewards (the "Service"), operated by Triton Loyalty, and KKGL-FM (together, Triton Loyalty and KKGL-FM are referred to as "we", "us" or "our") is provided to you ("you," "your" or "User") under the following terms and conditions, including any amendments thereto and any additional terms and conditions, rules or policies that may be applicable to particular offerings made in connection with the Service (collectively, the "Terms and Conditions"). We reserve the right to update or change these Terms and Conditions from time to time. Any such changes shall be reflected in an updated version of the Terms and Conditions posted on this site. By continuing to use the Service following the posting of any such change, you will be deemed to have agreed to the amended version of the Terms and Conditions. Any failure to comply with these Terms and Conditions by you may result in the termination of your account, and the forfeiture and relinquishment of all Points you have accrued in the Service. BY REGISTERING TO USE THE SERVICE, YOU AGREE TO BE BOUND BY THESE TERMS AND CONDITIONS, SO PLEASE READ THEM CAREFULLY. Unless otherwise specified in connection with particular offerings, participation in the Service is open only to natural persons who are 18 years of age or older. Employees or agents of KKGL-FM, Triton Loyalty, and each of their respective affiliates, and immediate family members of or persons domiciled with any such persons are not eligible to participate. In consideration of your use of the Service, you agree to provide true, accurate, current and complete information about yourself as prompted by the registration form and to maintain and promptly update your personal data to keep it true, accurate, current and complete. If you provide any information that is untrue, inaccurate, not current or incomplete, or if we or any of our service providers have reasonable grounds to suspect that such information is untrue, inaccurate, not current or incomplete, we have the right to suspend or terminate your account and to refuse any and all current or future use of the Service (or any portion thereof) by you. You may not register with a disposable email address. Only one member account per person and two member accounts per household. If you are 18 years of age or under you cannot post information about yourself on the website or complete the registration process. You can, among other things, review your accumulated Points, review the Terms and Conditions as amended from time to time, and review redemption options at 96-9theeagle.listenernetwork.com . KKGL-FM and Triton Loyalty (collectively, 'us', 'we', 'Operators') have created this privacy statement in order to demonstrate our firm commitment to privacy. The following discloses our information gathering and dissemination practices for the Eagle Rewards website ('Site'). A complete copy of these rules can be obtained at the offices of radio station KKGL (“Station”),owned and operated by Cumulus Radio Corp., 1419 W Bannock Dr Boise 83702, during normal business hours Monday through Friday or by sending a self-addressed, stamped envelope to the above address. 1.Eligibility. This Contest is open only to legal Idaho residents age twenty one (21) years or older as of the time of entry with a valid Social Security number and who reside in the Station’s Designated Market Area (“DMA”), as defined by Nielsen. Void where prohibited by law. Employees of Cumulus Media Holdings Inc., its parent company, affiliates, related entities and subsidiaries, promotional sponsors, prize providers, advertising agencies, other radio stations serving the Station’s listening area, and the immediate family members and household members of all such employees are not eligible to participate. The term “immediate family members” includes spouses, parents and step-parents, siblings and step-siblings, and children and stepchildren. The term “household members” refers to people who share the same residence at least three (3) months out of the year. The Contest is subject to all applicable federal, state and local laws and regulations. Participation constitutes entrant’s full and unconditional agreement to these Official Rules and Sponsor’s decisions, which are final and binding in all matters related to the Contest. Winning a prize is contingent upon fulfilling all requirements set forth herein. Any person who, as of January 8, 2019, has any type of talent and/or management representation (e.g., a talent agent or manager), is under any type of professional performance contract (including but not limited to, a music recording contract, a talent contract, an acting contract), and/or is party to a merchandising or sponsorship contract is eligible to participate in the contest, however, the participant will be responsible for any and all fees owed under these agreements and/or to these agencies. Any person who is a member of SAG/AFTRA or any similar union is NOT ELIGIBLE to participate in this Contest. 2.Contest Period. The Contest will begin at 2:00pm MST on January 8, 2019 and will run through January 20, 2019 (“Contest Period”).The period to submit an entry form will commence on 2:00pm MST on January 8, 2019 and continue through 11:59pm MST on January 20, 2019 (the “Entry Period”). The Station’s computer is the official time keeping device for this Contest. 3.How to Enter. Visit the Station’s website www.KKGL.com during the Entry Period, click on the “Classic Car Search” Contest link, and complete an entry form (“Entry Form”) that includes your full legal name, birth date, residence address, email address, phone number, and 1 recent color photographs of the vehicle. All Entry Forms must be received by 11:59 pm MST on January 20, 2019 to be eligible to qualify to participate in the Classic Car Search. Limit one (1) entry per person per email address during the Entry Period. Multiple participants are not permitted to share the same email address. Any attempt by any participant to submit more than one (1) entry by using multiple/different email addresses, identities, registrations and logins, or any other methods will void that entry and the participant may be disqualified. Use of any automated system to participate is prohibited and will result in disqualification. Station is not responsible for lost, late, incomplete, invalid, unintelligible, inappropriate or misdirected entries, all of which will be disqualified. In the event of a dispute as to any registration, the authorized account holder of the email address used to register will be deemed to be the participant. The “authorized account holder” is the natural person assigned the telephone number by the wireless carrier or an email address by an Internet access provider, online service provider or other organization responsible for assigning email addresses for the domain associated with the submitted address. Potential winner may be required to show proof of being the authorized account holder. All entries become the sole and exclusive property of Station and will not be returned. Station reserves the right to contact entrants and all other individuals whose email address is submitted as part of this promotion. No mail-in entries will be accepted. By entering the Contest, each participant hereby consents to the Station’s use of their and their vehicle’s name, voice, likeness, and biographical information for on-air broadcast and for advertising and promotional purposes without payment or additional consideration. All participants further agree that the Station owns or will own exclusively any recordings, video, or photographs of such participants, including the copyrights in them, regardless of the form in which they have been or may be produced and used, and all participants assign all such ownership rights to the Station. Station shall have the right to copy, edit, broadcast, publish and use, in whole or in part, any materials featuring participants, in any manner without compensation. 6.Selection of Vehicles. On or about January 22nd, 2018, the Station will select up to fourteen (14) Qualifiers as candidates to be featured in the Rock Girl Calendar. The Station representatives in their sole and exclusive discretion and the Station’s decisions regarding the selection are final and binding and not subject to challenge. Candidates for the Rock Girl Calendar, are subject to verification of eligibility and compliance with the terms of these rules and availability with the calendar shooting schedule. No transfer or assignment of opportunity may be allowed. Station’s decisions as to the administration and operation of the Contest and the selection to participate in the calendar shoot, including alternates, are final and binding in all matters related to the Contest. 7.Verification of Winners. POTENTIAL WINNERS ARE SUBJECT TO VERIFICATION BY STATION WHOSE DECISIONS ARE FINAL AND BINDING IN ALL MATTERS RELATED TO THE CONTEST. The potential winners must continue to comply with all terms and conditions of these Official Rules, and winning is contingent upon fulfilling all requirements. The potential winners will be required to sign and return to Station, within three (3) days of the date notice is sent, an affidavit of eligibility and a liability/publicity release (except where prohibited) in order to claim his/her prize, if applicable. A potential winners who returns the affidavit of eligibility and liability/publicity release will be deemed to have accepted the Contest Prize and thereafter will not be permitted to rescind their acceptance of the prize and/or return the prize. If a potential winner cannot be contacted, fails to sign and return the affidavit of eligibility and/or the liability/publicity release within the required time period (if applicable), or if the prize or prize notification is returned as undeliverable, potential winner forfeits prize. In the event that the potential winner is disqualified for any reason, Station may award the applicable prize to an alternate or the Qualifier with the next highest score. 9.Entry Conditions and Release. By entering, each participant agrees to: (a) comply with and be bound by these Official Rules and the decisions of the Station, which are binding and final in all matters relating to this Contest; (b) release and hold harmless Station, Cumulus Media Inc., and its subsidiaries, related and affiliated companies, participating sponsors, the prize suppliers and any other organizations responsible for sponsoring, fulfilling, administering, advertising or promoting the Contest, and each of their respective past and present officers, directors, employees, agents and representatives (collectively, the “Released Parties”) from and against any and all claims, expenses, and liability, including but not limited to negligence and damages of any kind to persons and property, including but not limited to invasion of privacy (under appropriation, intrusion, public disclosure of private facts, false light in the public eye or other legal theory), defamation, slander, libel, violation of right of publicity, infringement of trademark, copyright or other intellectual property rights, property damage, or death or personal injury arising out of or relating to a participant’s entry, creation of an entry or submission of an entry, participation in the Contest, acceptance or use or misuse of prize (including any travel or activity related thereto) and/or the broadcast, exploitation or use of entry; and (c) indemnify, defend and hold harmless the Released Parties from and against any and all claims, expenses, and liabilities (including reasonable attorneys’ fees) arising out of or relating to an entrant's participation in the Contest and/or entrant’s acceptance, use, non-use or misuse of the prize. 10.Publicity.Except where prohibited, participation in the Contest constitutes participant’s and winner’s consent to Station’s and its agents’ use of winner’s name, likeness, photograph, voice, opinions and/or hometown and state for promotional purposes in any media, worldwide, without further payment or consideration, unless otherwise prohibited by law. 11.Taxes.All State, Local, Federal and or other taxes, duties, tariffs, title fees, licensing fees, or other fees for prizes awarded become the sole responsibility of the winner. All those who win prizes or earn talent fees valued $600 or more in any given year will be issued an IRS Form 1099 to report their winnings and/or earnings. 12.General Conditions. Station reserves the right to cancel, suspend and/or modify the Contest, or any part of it, if any fraud, technical failures or any other factor beyond Station’s reasonable control impairs the integrity or proper functioning of the Contest, as determined by Station in its sole discretion. Station reserves the right in its sole discretion to disqualify any individual it finds to be tampering with the entry process or the operation of the Contest or to be acting in violation of these Official Rules or any other promotion or in an unsportsmanlike or disruptive manner. Any attempt by any person to deliberately undermine the legitimate operation of the Contest may be a violation of criminal and civil law, and, should such an attempt be made, Station reserves the right to seek damages from any such person to the fullest extent permitted by law. Station’s failure to enforce any term of these Official Rules shall not constitute a waiver of that provision. 13.Limitations of Liability. The Released Parties are not responsible for: (1) any incorrect or inaccurate information, whether caused by entrants, printing errors or by any of the equipment or programming associated with or utilized in the Contest; (2) technical failures of any kind, including but not limited to malfunctions, interruptions, or disconnections in phone lines or network hardware or software; (3) unauthorized human intervention in any part of the entry process or the Contest; (4) technical or human error which may occur in the administration of the Contest or the processing of entries; or (5) any injury or damage to persons or property which may be caused, directly or indirectly, in whole or in part, from entrant’s participation in the Contest or receipt or use, non-use or misuse of any prize. If for any reason an entrant’s entry is confirmed to have been erroneously deleted, lost, or otherwise destroyed or corrupted, entrant’s sole remedy is another entry in the Contest, provided that if it is not possible to award another entry due to discontinuance or completion of the Contest, or any part of it, for any reason, Station, at its discretion, may elect to hold a random drawing from among all eligible entries received up to the date of discontinuance for any or all of the prizes offered herein. No more than the stated number of prizes will be awarded. In event that production, technical, programming or any other reason causes more than stated number of prizes as set forth in these Official Rules to be available or claimed, Station reserves the right to award only the stated number of prizes by a random drawing among all legitimate, unawarded, eligible prize claims. 14.Disputes.Entrant agrees that: (i) any and all disputes, claims and causes of action arising out of or connected with this Contest, or any prizes awarded, other than those concerning the administration of the Contest or the determination of the winner, shall be resolved individually, without resort to any form of class action; (ii) any and all disputes, claims and causes of action arising out of or connected with this Contest, or any prizes awarded, shall be resolved exclusively by the United States District Court or the appropriate state court located in the Station’s listening area; (iii) any and all claims, judgments and awards shall be limited to actual out-of-pocket costs incurred, including costs associated with entering this Contest, but in no event attorneys’ fees; and (iv) under no circumstances will entrant be permitted to obtain awards for, and entrant hereby waives all rights to claim punitive, incidental and consequential damages and any other damages, other than for actual out-of-pocket expenses, and any and all rights to have damages multiplied or otherwise increased. SOME JURISDICTIONS DO NOT ALLOW THE LIMITATIONS OR EXCLUSION OF LIABILITY FOR INCIDENTAL OR CONSEQUENTIAL DAMAGES, SO THE ABOVE MAY NOT APPLY TO YOU. All issues and questions concerning the construction, validity, interpretation and enforceability of these Official Rules, or the rights and obligations of entrant and Sponsor in connection with the Contest, shall be governed by, and construed in accordance with, the laws of the state in which the Station is located, without giving effect to any choice of law or conflict of law rules (whether of the state in which the Station is located or any other jurisdiction), which would cause the application of the laws of any jurisdiction other than the state in which the Station is located. 16.Contest Results. A winners list may be obtained after January 30, 2019 by sending a self-addressed stamped envelope to the Contest Sponsor identified below. CONTEST SPONSOR: CUMULUS RADIO CORP., KKGL-FM, 1419 W. Bannock Street, Boise, ID 83702.